The Holly Project is a free support service for survivors of Child Sexual Exploitation (CSE). It is an independent drop in service that is run by survivors of CSE. It offers a safe place for individuals and their families to get support and advice from people who really understand the trauma and lasting impact of CSE. 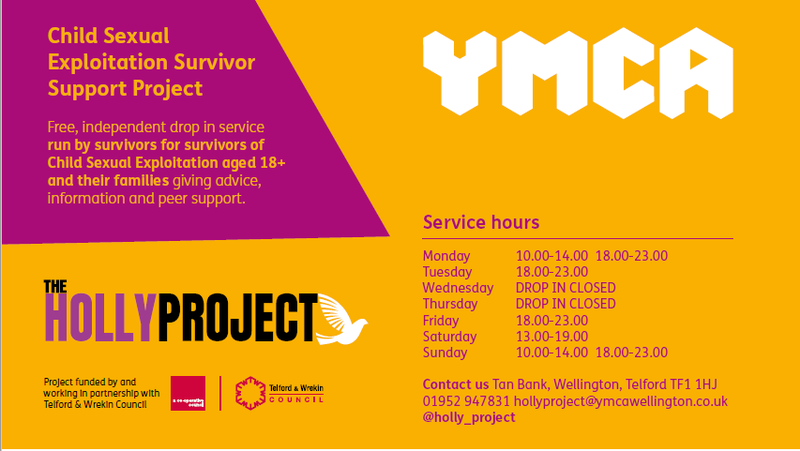 The Holly Project runs groups for survivors and victims as well as families and parents - details of our opening hours are below. The service launched in August 2018, and is based at our Tan Bank office in the heart of Wellington. Please watch this video for more information about how we work in partnership with Telford and Wrekin Council and other organsations to support survivors of CSE.